AUSTRALIAN POLICE SAY they might have solved the mystery of an SOS signal made of rocks in the outback of Western Australia. The rocks sparked a search for missing people when they were spotted by a helicopter pilot last month at Swift Bay, a remote area 120 kilometres west of the Kalumburu Aboriginal Community in the Kimberley region. Police officers were quickly alerted and flew into the area with the assistance of a helicopter to conduct a ground search. They did not find anyone at the scene at the time. However now police believe the sign was a genuine distress signal left by a man and a woman who became stranded in 2013 and were eventually rescued. Bujumbura police Acting Senior Sergeant Dave Rudd told ABC News that international coverage of the case resulted in a man getting in contact to say his brother was responsible for the message. “He indicated it was his brother Robert that left the SOS there,” Rudd said. Without knowing the full details, because I haven’t been able to speak to him yet, the man made it into a small evacuation vessel with another person, a woman. “But it was attacked by crocodiles. They had some basic rations on them, and found some fresh water, and they survived there for several days,” he told ABC. The police have said that the man who supposedly left the sign is currently travelling on a boat in the Mediterranean Sea with limited phone and internet access, so they haven’t been able to make contact to confirm that it was in fact him that left the message. Rudd said this situation is a reminder that people travelling in the remote areas of Australia should carry emergency communication equipment such as a satellite phone or an EPIRB, along with sufficient amounts of food and water. 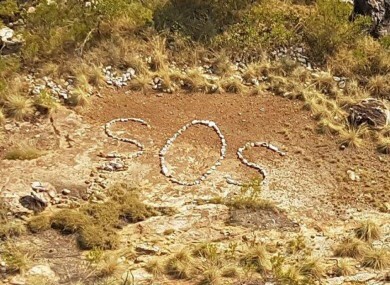 Email “Australian police get to the bottom of mysterious SOS sign in the outback”. Feedback on “Australian police get to the bottom of mysterious SOS sign in the outback”.